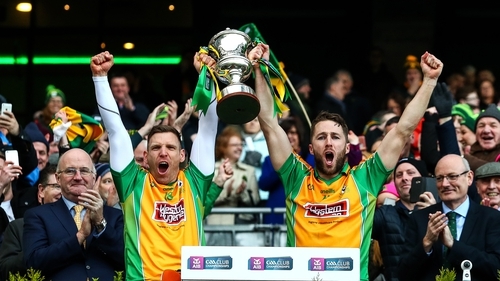 Corofin overwhelmed Dr Crokes to retain the All-Ireland club football crown in style at Croke Park. Jason Leonard and Gary Sice finished superb team moves to the net in the first half before Crokes captain John Payne was dismissed for lashing out at Dylan Wall with the boot, and the Galway kingpins took a 2-07 to 0-06 lead into the interval. 2017 champions Crokes, who had beaten Mullinalaghta in the semi-final despite also losing a man early on, battled gamely after the restart but failed to score again from play despite the introduction of Kerry legend Colm Cooper. Former Galway star Gary Sice (1-05), Jason Leonard (1-03) and Martin Farragher (0-4) all filled their boots and even the injury-time dismissal of veteran Kieran Fitzgerald on a second yellow card couldn’t spoil the party as Corofin claimed their third Andy Merrigan Cup in five years in convincing fashion. Crokes had opened the scoring through a Tony Brosnan free but it didn’t take long for Corofin to get their flowing handpass attack going. Martin Farragher hit back with the first of four excellent points he managed on the day and Dylan Wall struck the crossbar after a Micheál Burns score before the Galway men had their first goal. Martin Farragher’s shot was brilliantly blocked but Kieran Molloy volleyed the loose ball into the path of Jason Leonard, who fired low and to the net. Daithi Burke stormed forward to unleash a shot that only just cleared the crossbar and Farragher split the posts again, either side of points from Daithi Casey and Brosnan that cut the gap to a single point, 1-3 to 0-05 after 18 minutes. Amazingly, Brosnan's effort was to be Crokes’ last score from play. Martin Farragher, Daithi Burke and Ian Burke combined to set up the irrepressible Sice for an easy fisted finish before Payne received his marching orders. Wall hit the Crokes corner-back with a high tackle and, as he fell, Payne seemed to react by kicking out at his aggressor. Sice (2) and Leonard tacked on three unanswered scores for a four-point lead at half-time - 2-07 to 0-6. Corofin didn’t ease up upon the resumption, Shane Murphy called into action to deny Mike Farragher with a brilliant save while Leonard’s shot crept just over. Crokes called for the cavalry early, summoning the Gooch after just 37 minutes. But he was powerless to stem the tide as they hit a succession of poor wides and Corofin relentlessly drummed home their advantage with points from Sice, Leonard, Daithi Burke and the Farraghers. Cooper did manage to get on the scoresheet, a free just before Fitzgerald received his marching orders for another yellow, but the last word went to the irrepressible Molloy, who got forward to confirm a crushing victory. Corofin: Bernard Power; Cathal Silke, Kieran Fitzgerald, Liam Silke; Kieran Molloy (0-1), Dylan McHugh, Dylan Wall; Daithí Burke (0-02), Ronan Steede; Gary Sice (1-05, 3f), Micheál Lundy (capt), Jason Leonard (1-03); Ian Burke, Martin Farragher (0-04), Mike Farragher (0-01). Subs: Colin Brady for L Silke (ht), Conor Cunnigham for McHugh (48), Gavin Burke for Lundy (53), Ciaran McGrath for Wall (54), Dylan Canney for Sice (57), Ciarán Brady for D Burke (57). Dr Crokes: Shane Murphy; John Payne (capt), Michael Moloney, Fionn Fitzgerald; David O’Leary, Gavin White, Shane Doolan; Johnny Buckley, Daithí Casey (0-3, 2f); Micheál Burns (0-1), Gavin O’Shea, Brian Looney; David Shaw, Kieran O’Leary, Tony Brosnan (0-5, 4f). Subs: Micheál Potts for Doolan (ht), Colm Cooper (0-1f) for O’Shea (37), Jordan Kiely for K O’Leary (41), Alan O’Sullivan for D O’Leary (43), Eoin Brosnan for Casey (52), Jason Lyne for Looney (57).